Evil lies between these walls. Horrible monsters and specters roam the mansions, crypts, schools, monasteries and ruined buildings around Arkham, Massachusetts. Some are dark conspiracies while others wait for unfortunate victims to devour them or plunge them into madness. It is a handful of brave investigators who will explore these accursed places and discover the truth about these living nightmares. 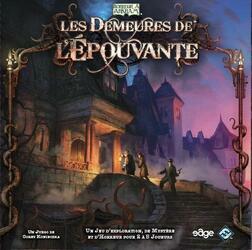 Demeure de l'Épouvante is a macabre game of horror, madness, and mystery. Each part takes place as part of a story providing players with a unique set and several plot combinations. These intrigues affect the monsters that the investigators can meet, the clues to discover, until the final denouement. A player takes the role of the guardian, who controls monsters and other evil powers. The other players are investigators, seeking to solve the mystery while struggling to survive and not go crazy. Do you dare enter The Remains of the Terror?